When you enter into the world of Cliff and Claire Huxtable, their love is one that is rare indeed. Living in a house with five children consumes a majority of the plot lines, but the ways Cliff and Claire maintain their relationship as husband and wife are just as important. Using social maintenance behaviors, we can understand the things that Claire and Cliff do inorder to maintain their relationship. One of the most prominent ones described in Close Encounters is, "using inside jokes, humor and sarcasm" (22). Humor is very prevalent throughout the entire show but especially in Claire and Cliff's relationship. Jokes, pranks, and laughter is a very important part of their relationship and it is something that maintains their relationship. They not only laugh at each other, but their children, their lives and all things that come with being a Huxtable. This clip shows Cliff cutting into the middle of Claire's cake before dinner, and his attempts to hide it. When Claire finds it she does not get mad at Cliff but instead shoots it right back at him so they can laugh about it. Sternberg's Triangular Theory of Love, pictured below, also can help understand why Cliff and Claire's relationship is a long lasting one. Intimacy is referred to at the "warm" component of a relationship (23). This means that intimacy is "based on feelings of emotional connection and closeness" (24). In their relationship, we know that Cliff and Claire care about each other, but how do we know that? This is through their interactions, their humor with each other, their conversations we are let in on, and their famous talks before bed. Another side of the triangle is the "hot" component, which is the passion. This is generally the hardest to maintain. Cliff and Claire are an example where we can see passion through having children they have a desire for success, and happiness for their children. They also have this for one another, sure we are hinted at the sexual attraction between the two, but in this show that is not something that we see often and explicitly. This clip shows both of these sides of the triangle in their relationship. The final side of the triangle is the "cool" side. Close Encounters describes this as the commitment side, referring to "the decision to love someone and the commitment to maintain that love" (25). Throughout the entire series we see many ups, downs, and unexpected turns but at the end of every episode Cliff and Claire are there together, loving each other, loving their life, and their children. This is how Cliff and Claire uphold that cool side of the triangle. Their is a trust in their relationship that we as viewers can even notice, see, and pick up on. In the smallest of ways they are committed to the biggest thing in their family, their love. 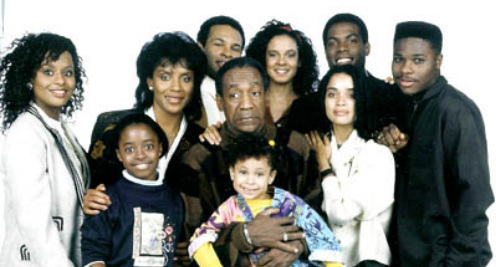 Without that there would not be a Huxtable family and their would not be a "Cosby Show".